Enjoy & have a nice meal !!! 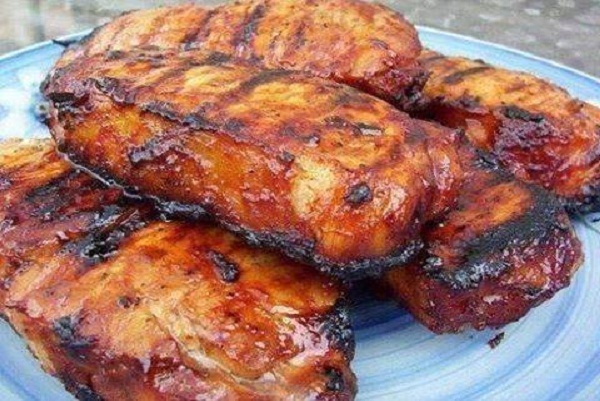 : Garlic & Honey Pork Chops!! Garlic & Honey Pork Chops!! 1 Combine all ingredients in a plastic zipper bag and refrigerate for a day (quickly putting everything together first thing in the morning is easy and works well). 2 At cooking time, drain chops and reserve some of the marinade for basting, then either preheat a grill with medium-hot coals or preheat your broiler; depending on the thickness of your pork chops, total cooking time should take 12 to 15 minutes, turning once and basting with the reserved marinade a couple of times early on.